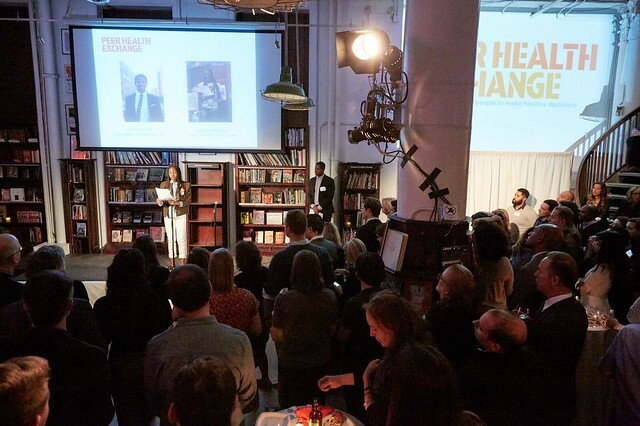 More than 200 friends, donors, volunteers and staff joined our New York site for A Night Out for Health at Housing Works Café and Bookstore February 6. The inspiring evening raised funds to support New York’s reach, which serves almost six thousand ninth graders who would not otherwise have any health education. Young people like Akilah, a high school student who talked about the impact Peer Health Exchange had on her understanding of consent. The evening was full of so many special moments, including share-outs by our volunteers on how our program has contributed to their growth. Jordan, a college volunteer who spoke at the event, showed remarkable bravery in disclosing his sexual assault and sharing about the strength he gained through volunteering with Peer Health Exchange. Saif and Helena lead attendees to think critically about themselves, and how they understand consent through a (condensed!) Peer Health Exchange workshop. “I saw the power of peer-to-peer education. Many times, in Peer Health Exchange, I may have entered the room as the educator, but I leave being the one educated.” Jordan remarked. Our supporters make it possible for us to empower young people with the knowledge, skills, and resources they need to make healthy decisions. Thanks to each of you, we reach almost six thousand ninth graders in New York City who would not otherwise have any health education. And still, there are 92 thousand ninth graders and only 153 trained health teachers in New York’s public schools– we have more work to do to fill this gap. Thank you to everyone who has already supported Peer Health Exchange NYC! If you are interested in learning more about Peer Health Exchange NYC, you can reach out to Taylor Gramps, NYC Development Manager at tgramps@peerhealthexchange.org. We would love to take you to a workshop, or introduce you to our amazing volunteers!